The easy way to carry your gear. Approx. 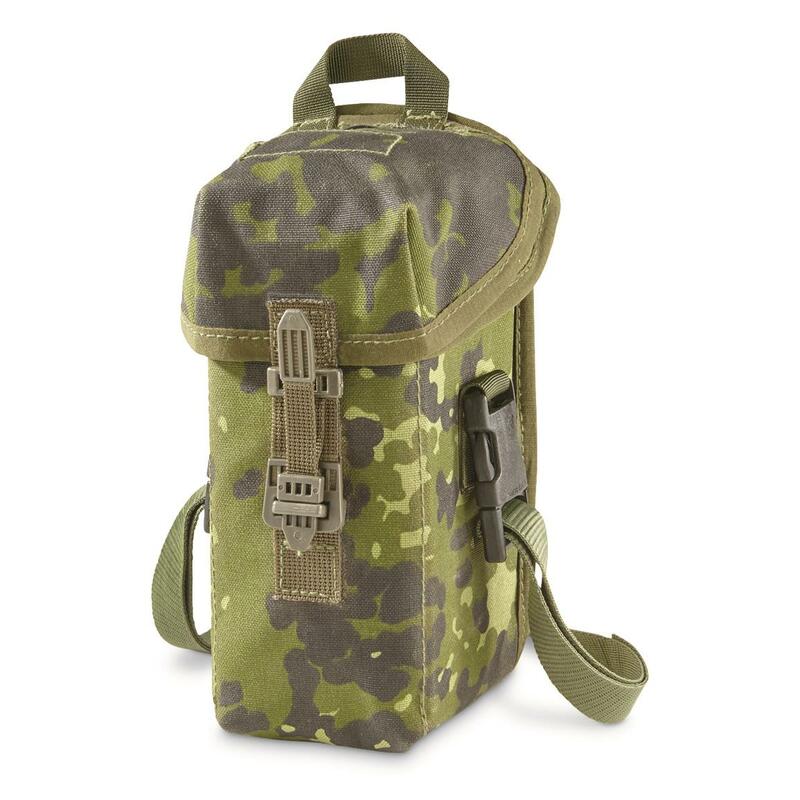 4" x 4" x 7"
Whether you're heading to the woods for hunting or hiking, bring along this Danish Military Surplus Utility Pouch. It's made from durable polyester canvas and features a top flap with locking mechanism for secure storage. Adjustable nylon shoulder strap makes it easy to carry, or use the built-in belt loops to attach it to your pistol belt or similar. Great for holding extra mags, small hunting accessories, and more. Dimensions: Approx. 4"x 4" x 7"
Danish Military Surplus Utility Pouch, Used is rated 4.7 out of 5 by 3. Rated 5 out of 5 by Chris from Great surplus pouch True surplus in a cool pattern. Should have bought more than one of these. Rated 4 out of 5 by Rude Dogg Outdoors from Great pouch...but a lil rough. PERFECT size pouch for a nalgene bottle & nesting cup. I'm going to set it up with a small cook kit. Pouch was a little rougher than I hoped. Nothing a little gorilla tape couldn't fix. Many mounting options make it versatile. Highly recommend...but don't expect it to look as nice as the pic. Rated 5 out of 5 by Otto from This is an ammunition pouch for 7.62 machinegun ammo This high quality pouch can be carried on a PLCE-type belt (or any other belt, really), or carried by the included strap. There is a sturdy metal wire on the back for attaching the pouch onto a machine gun. This can easily be removed if you do not own a machine gun. The pouch has two openings: The top one is yanked open for quick access for belted ammunition. The other opening is closed using the Spanish Fly buckle as seen on the photo. Possible uses include: For carrying a small thermos flask, for carrying magazines, goggles, etc. 6.25" x 4.5" x 2", 6 oz. Keep tactical necessities close at hand. Each 4.5" x 3" x 2.5"
Old school leather gear carriers.